The Borja Family: Book Review: A Double Feature! Book Review: A Double Feature! I grabbed the book Not A Box by Antoinette Portis at our library for the simple fact that it was on a few recommended reading lists. I had no idea how fun it was going to be reading this with the boys. Nor did I know that a few days later I would be picking up it's companion Not A Stick. 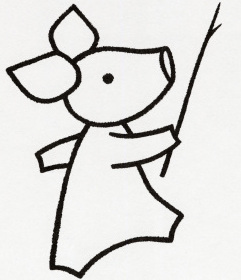 The simple, silly text and the wonderful illustrations seem to bring the everyday adventures of boyhood to life. 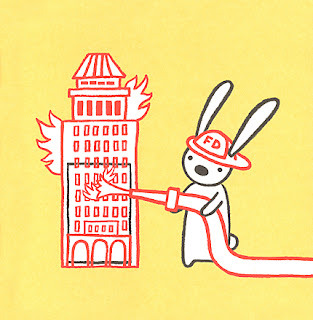 The books start off simply enough: a bunny playing with an empty box. The narrator asks, "Why are you sitting in a box?" To which the bunny replies, "It's not a box." "Well then, what is it?" seems to be the next logical question. ...a burning building and so much more! Guess what? That's not a stick either. ...or perhaps a prod in the hand of a fearless cowboy? 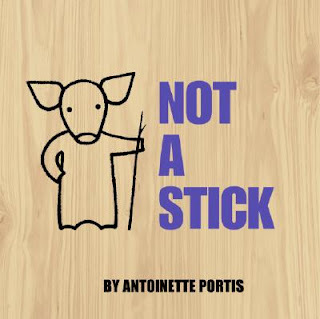 I simply cannot say enough about Antoinette Portis' books! They are so much to read together, even Daddy took a turn with them at bedtime! The boys giggled and laughed at the frustrated characters explaining their "inventions" and ooh-ed and aah-ed at every illustration. The books can be purchased as hardcover, paperback, or boardbooks and are very reasonably priced: roughly $8-10 each if purchased new.